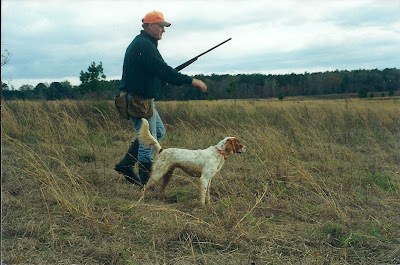 A Bird Hunter's Thoughts: Blast from the past! This picture was taken in 2001 at the Quail Unlimited National Championship in Bronwood, GA. The dog is Bo (Julia's Bocephus) and that's me as the handler. This picture was snapped very close to the gallery right after Bo found his 6th (and winning) bird. I'm not sure who was more focused. Bo is still with me and, as long as he wants to get in the box, he's got a place on my trips.